Welcome to my Baltimore Faves! 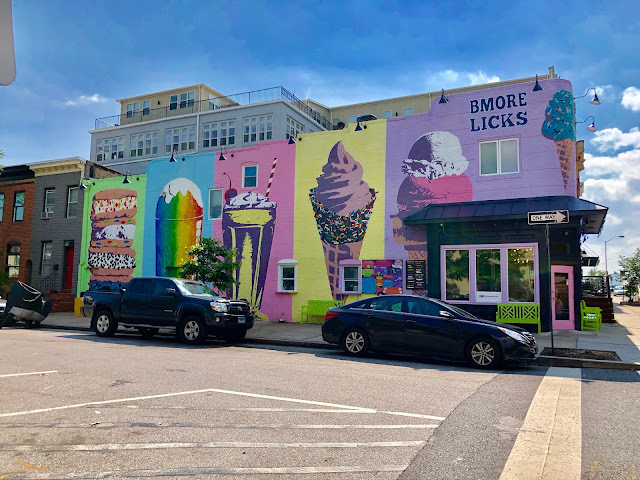 I have been living in Baltimore my whole life, and even now I still find new spots to eat, fun places to go and things to do every day. I promised you a tour of my favorite local spots so here she is....ENJOY my beautiful city! Baltimore is ever changing in so many good ways. The number one spot to see is the Baltimore Inner Harbor, with all of the updates and changes it really has morphed into a beautiful place. We'll start off with the mall, there is 3 levels of A+ shopping at the Gallery, it includes stores like Victoria's Secret, Forever21, Pandora, Starbucks, the Gap, Foot Locker, Aldo, and The Sunglass Hut, just to name a few. 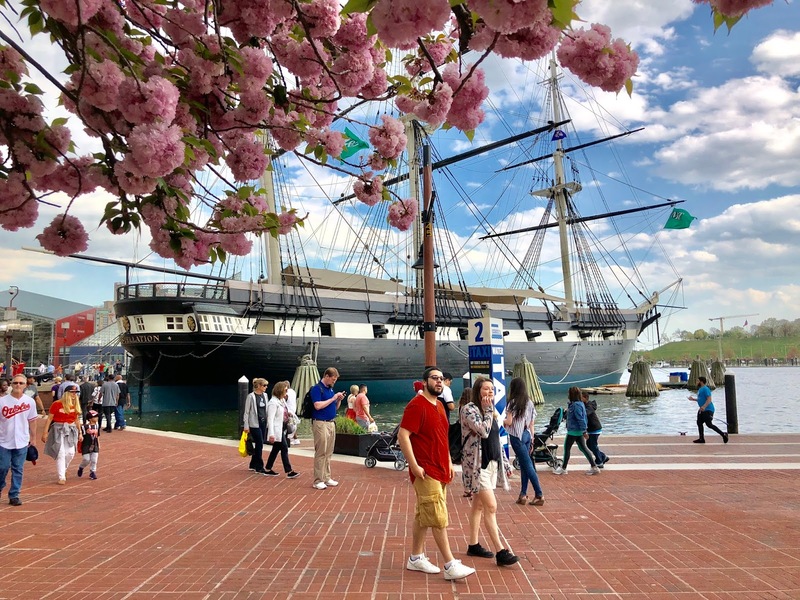 Then if you cross the street to Harborplace there are a couple more larger sections of restaurants and stores that wrap around the actual harbor where there are boats, docks, and even a submarine. Each are available to board and explore. We also have the Aquarium and the Trade Center where you can see the 911 memorial. Some of the restaurants include Hard Rock Cafe, Bubba Gump Shrimp, The Rusty Scupper and one of my personal favorites McCormick & Schmicks. We stopped in the other day for dinner and were more than impressed, I was surprised that it was our first time eating there. To start off we ordered a wedge salad with blue cheese, I also ordered a strawberry basil smash, it's such a good cocktail. When I order it I always say to make it sweet, it has a strawberry lemonade flavor. For our entrees I ordered the garlic beef medallions, with roasted red pepper mashed potatoes and broccoli. Rob ordered the salmon platter, it came atop a beet and onion mixture of some kind. I didn't pay to much attention to it because I'm so not enthused by beets. I absolutely loved the beef medallions, I could have cut them with a butter knife it was so tender, not to mention the drink was out of this world, hence the reason I had two. Rob also raved about his plate, he told me the salmon was cooked to perfection and full of flavor. We will be eating there again for sure. If you are more interested in breakfast you can go just a bit down the road to Miss Shirley's, it's an iconic Baltimore spot known for their amazing breakfast/brunch menu. I had the southwest omelette last time I was there, it's beyond fantastic and more than enough for the price. We also like a place called Tagliata, it's an Italian restaurant just a few blocks away as you get into Little Italy. The food there tastes amazing and the restaurant is absolutely stunning. At Tagliata I always order the chicken marsala, with a side of spaghetti, and we side it with the pea soup. I know you're thinking ugh pea soup, but I promise you this will be the best you have ever had. They also give you fresh bread and in house parmesan cheese by the chunk, it's the real deal when it comes to authentic Italian food, and they are all at a good price point so they're more than affordable. oh-so-boring vanilla and chocolate, or don't let me forget the chocolate and vanilla swirl. They also have a ton of unique hard scoop ice cream flavors, I love going there because they give me so many choices and options to make the Insta-worthy cones you see on my Instagram feed every Saturday. The second cone shot down with the blue soft serve was a cotton candy flavor as was the cone, wow is all I can say. there was even choices for Pip. 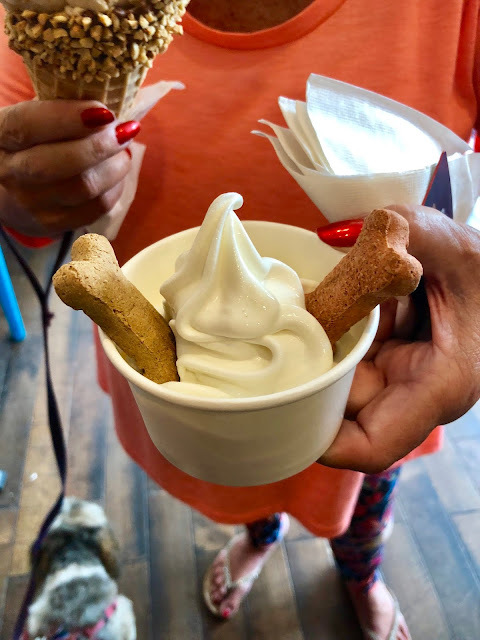 They have a yummy pup sundae with vanilla ice cream, and 2 milk bones treats. Needless to say Piper ate it in two seconds flat, I'm guessing because it was good and 95 degrees out...she ate it so fast that I was wondering if she got a brain freeze....lol!! 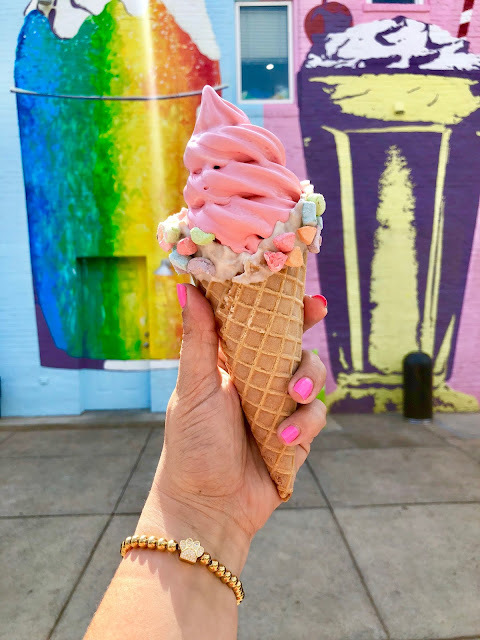 I could talk about ice-cream all day but there's more to show you!! Lastly let's talk about a hotel, being a blogger I have stayed in many all over the east coast. You guys know that Pip goes with us everywhere, so I was overly elated to discover the Monaco Hotel by Kimpton, just up the street from the Inner Harbor. It's the most pet friendly hotel I have ever stayed in, they had a pet bed, dog bowls, dog treats and even a dog toy for Pip. The whole hotel was out of this world stunning, and super clean. There are no words for how grand the front entrance is, I can only show you the pictures so you see just what I mean. The staircases are all marble from top to bottom, everything was created with the utmost class. I had no idea a gem like this existed downtown, and to top it all off the rooms are moderately priced. The huge chandelier and rugs, the lighting and marble all create this amazing vibe. Then up on the 2nd floor just off to the right from the front desk, they have the coziest little lounge area where they offer complimantary drinks for Happy Hour from 5-6 pm. Doesn't it remind you of something straight out of the 40's, it's just full of class. Now for the best part of all, the room and the food. We stayed in the Mediterranean sweet on the 9th floor, as you come into the door you are in the living/TV room which consists of a sofa, coffee table, and a swanky little end table and lamp, the room is full of color and character. Off to the left is the bedroom space, and let me tell you the bed was gorgeous, it has a huge statement headboard and super comfy mattress. Off to the right corner is a cute little office space, perfect for getting some work done. Now I'll admit I don't enjoy sleeping in beds other than my own for many reasons I'm sure you are aware of, but the bed and linens where so nice, comfy and clean, that you literally wanted to lay down and settle in. I was more than pleasantly surprised, and got thee best 2 nights of rest while I was there. Plus it's within walking distance of all the places noted here in this post, it's literally in the center of everything which makes it super conveninet. Back to the room tour, next up is the bathroom, OH MY GOODNESS talk about a spectacular bathroom. They carried the classy theme all throughout with marble from top to bottom, a granite counter top, and I don't know what the mirror frame was made out of, but it was so cool looking. The shower was big enough for two and included the best jet tub, which i soaked in for almost two hours. Another added point is the provided shampoo, conditioner and body wash. I have noticed that whenever I go to a hotel the provided little bottles are watered down, no good and completely ineffective. This is why I always make sure to pack my own, but in my haste to get everything together I left my shampoo and conditioner sitting on my bed...derp. So it was more than refreshing to see that the Monaco was on point, and wow did they all smell so good. Long story short it's less stuff I have to pack, along with the fact that their hairdryer to was great. Again less junk for me to drag with me because it's already provided. Oh I almost forgot the great view from the bathroom. Piper and I really enjoyed sitting in that window and just watching the world go bye. It was definitely one of my favorite things about the room, along with the room service. We ordered a big lunch to avoid going out because it was literally 100 degrees that day. We decided to stay in the hotel and enjoy all of the amenities. I ordered some pit beef sliders, a fruit and cheese plate, a salad and bowl of beef stew. Everything came hot and was more than flavorful, my favorite was the sliders. That's the thing I recommend, the bread was soft and fresh, the pit beef was tender and tasty, and they add crunchy fried onions, it was all just top of the line good. After our bellies were full Rob laid down for a nap and I used the desk area to get some much needed blogging done, it's all set up perfectly. We stayed a total of 2 nights and I honestly can say I am really impressed, so much so that when I go to New York for Fashion Week I plan to stay with the Kimpton again. I've never felt so at home in a hotel, the staff is very welcoming and friendly to both Piper and myself. That was another plus point for me, you guys know Piper goes everywhere with us, so it's important that she be welcomed as well. All in all we had a fantastic experience and I definitely recommend The Monaco 100%. Well that's all I have for now, but no worries I'm always posting about Baltimore, and as I said new stuff is always popping up as the city is ever-changing. I am so curious where you guys would like to see me go? What city are you most curious about seeing more of, yah never know I maybe I'll go there and do some exploring. I hope you all enjoyed being shown around my beautiful city, I'm very eager to read your comments and hear what you think of the post! !